Greenhous Commercials pride themselves in the customer service provided to their clients which leads to long-standing business relationships. This is certainly true of over 20 years of supplying DAF trucks to K Transport Services (Midlands) Ltd.
Dave Preston is the Fleet Maintenance Manager for K Transport. He reflects on the size of the fleet saying: “Probably 98% of our fleet are DAF trucks mainly XF tractors and CF 26T rigids. 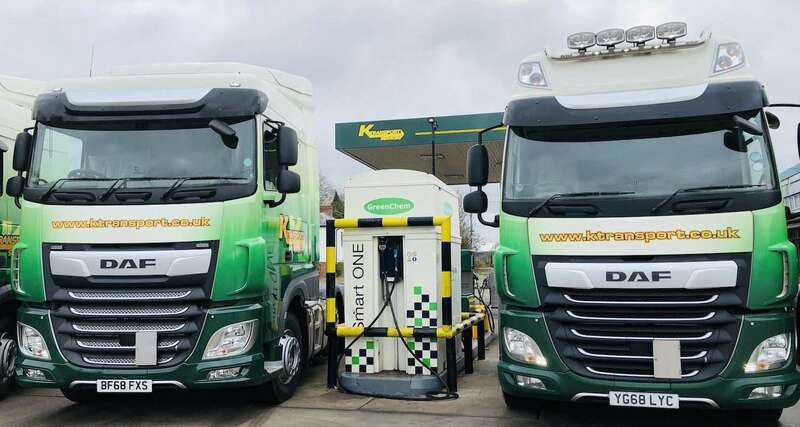 We are looking to renew our fleet as investment allows and this will have a marked effect on the effectiveness of the vehicles, emissions and fuel efficiency and comfort for the drivers. We are moving the fleet towards automatic transmissions. Fred Smith body builders and Truck Engineering who have provided the recent new livery wrapping are both Greenhous Commercials customers. With 6 inspection pits and 11 service technicians working in the K Transport workshop, which is IRTE accredited and fully computerised, the availability of parts is essential to keep the fleet operational. Working with Scott Westwood, Greenhous Commercials Fleet Parts Sales Manager, Dave ensures that there is always a full complement of spares in stock and Greenhous operate a multiple delivery per day of requested parts from their depot in Wolverhampton. Scott explains the Impress stock system that is in place at K Transport: “By working with K Transport we have a daily check on the levels of parts they have on their parts shelves.All parts are booked in and out on computer and popular parts are replenished more frequently on a daily basis by our parts van drivers. I can also come in and audit the stock and recognise which parts are not being used as often and adjust the stock levels for K Transport. DAF inspect and audit our attendance figures against KPI’s.